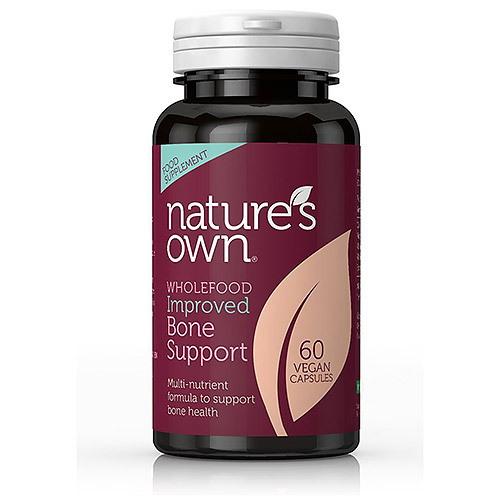 Nature`s Own Wholefood Improved Bone Support is a multi formula specifically tailored to provide adequate nutrients to maintain a healthy bone mineral density. Key active nutrients include Vitamin D3, Calcium, Magnesium and Vitamin K2. Bone Support formulation is specifically tailored for those who wish to ensure they are providing adequate nutrients to maintain a healthy bone mineral density. This supplement has excellent levels of all the important nutrients and includes Vitamin K a fat soluble vitamin that is an important co-factor to proteins which are essential for the bone building process. 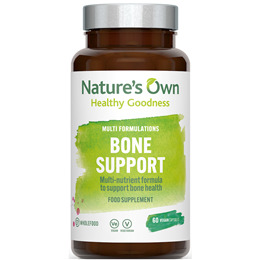 Bone Support Formula provides Wholefood Calcium an organic multimineral seaweed product, Calcium is needed in the development and maintenance of bone structure and rigidity. Magnesium is included as it aids in bone growth and is necessary for the proper functioning of muscles. Magnesium is an essential mineral - nearly 70% of the body’s supply is located in the bones. Vitamin D is most commonly associated with assisting with the maintenance of strong bones and teeth, and contributing toward normal muscle functions. Vitamin D3 is included in this supplement as it is the most bioavailable form of this nutrient. Nature`s Own was born in 1979; Nature`s Own are committed to offering the most effective products possible. Nature`s own work with Doctors and Practitioners as well as the general public, and it is vital that everything nature`s own do is the best and most natural possible. Our most important commitment is to create and sell products that are as close to nature as possible. Take 1-2 vegicaps daily with food or as directed by a practitioner. Below are reviews of Natures Own Wholefood Improved Bone Support - 60 Vegicaps by bodykind customers. If you have tried this product we'd love to hear what you think so please leave a review.